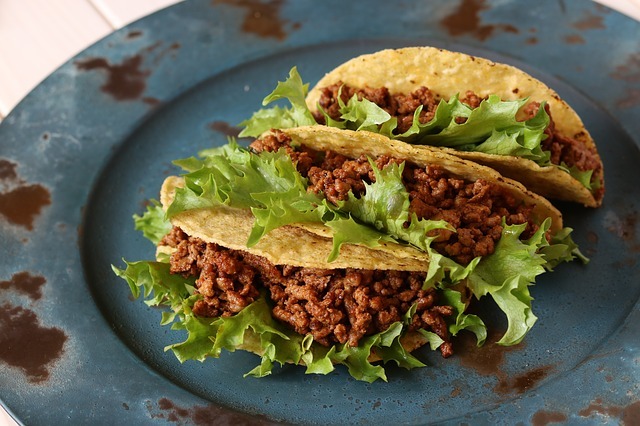 I like to cook up big batches of taco meat and then use it throughout the week for easy breakfasts, lunches, and dinners. I even freeze it in king-size silicone ice cube trays for super easy meals on days when the fridge is empty, like the day we return from a long vacation. I love knowing I don’t have to plan ahead or stop at the grocery store on the way home from the airport so we can have an easy dinner when we get home. The ideas below are quick and easy family-friendly ideas which you can (with a little more effort) make-over into low carb, gluten free, or Paleo by using zero-carb pasta, Zucchini Tots (recipe in an upcoming post), and low carb bread. So here goes – first of all, my taco filling is about half veggies and half meat. The basic recipe is the same as the traditional taco filling recipe, I just sub half veggies for half the meat. I sometimes even use packets of organic taco seasoning mix. Frozen Amy’s Organics Burritos topped with 1/4 cup taco filling mixed with 1/4 salsa. Quiche – use taco filling in place of veggies. I sometimes even add extra cooked veggies. Scrambled Eggs topped with taco filling, sliced avocado and cheese. Tomato Soup – with taco filling and beans added to make it a meal. Sopa de Tortilla – add taco filling and brown rice to chicken broth. Garnish with chopped avocado and shredded cheese. Nachos – spread tortilla chips on a baking sheet. Top with taco filling and cheese. Bake until cheese is melted. Pasta Mexicali – add taco filling to macaroni and cheese. We like Amy’s Organics but you can use whichever is your favorite. Taco Pie – in an oiled baking dish or pie plate layer tortilla chips, cheese, refried beans, and taco filling. Bake until dish is hot. Top with cheese. Return to oven until cheese is melted. Remove from oven and top with chopped avocado, shredded lettuce, chopped tomato and any more of your favorite taco toppers. Taco Casserole – in an oiled casserole dish mix cooked brown rice (or quinoa, or couscous, or millet, barley, buckwheat, bulgur, or farro) and leftover taco meat, beans, sour cream or yogurt, and corn. Top with shredded cheddar cheese and bake or microwave. Chili – add to a pot taco filling, kidney or pinto beans, canned tomatoes with their juice, and a chili seasoning packet. Heat to a low simmer and cook for at least thirty minutes. This is also a good crock pot meal. Taco Tots – bake up the tots. Top with taco filling and cheese. Return to oven until cheese is melted. Garnish with your favorite taco toppings. Stuffed Potato – top a baked potato with taco filling. Garnish with your favorite taco toppers. Taco Pasta – toss together cooked pasta, taco filling, cheese and sour cream. Taco Salad – top a salad with taco filling and your favorite taco toppers. Dress with ranch dressing. Taco Grilled Cheese – make a traditional grilled cheese sandwich, then open it and add some taco filling.